I gain so much inspiration from so many people in my life. 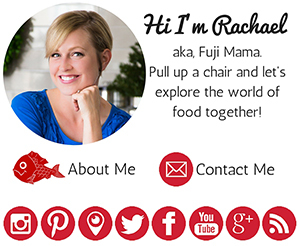 Since the food community is all about sharing in the collective experience, I am spotlighting some of those people. It has been forever since my last post in the spotlight series! Today I’d like to introduce you to my friend Noriko. 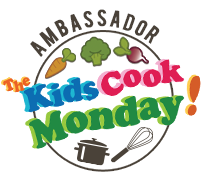 It’s thanks to Noriko that I posted that mystery ingredient last Friday, because you will be needing it in the recipe she is sharing with us today. I met Noriko when we were living in Tokyo because our husbands worked together. She has the most gorgeous little girl who was born a few months after we moved back to the US, so I have yet to meet her. Noriko was actually born in Singapore, lived in Malaysia for 3 years, a year in Shizuoka, Japan, 12 years in Seattle, and now has been back in Japan for the past 14 years. 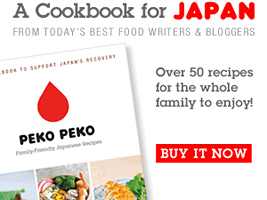 Growing up, Noriko’s mom cooked mostly Japanese food. Noriko thinks she did this because she wanted Noriko and her sister to have a “taste” of Japan, since they lived abroad longer than they lived in Japan. Noriko had a Chinese nanny when she lived in Malaysia, so her mom also used to make Chinese dishes that her nanny taught her to make. Noriko’s favorite food growing up was umeboshi onigiri (pickled plum rice balls) made with umeboshi that her grandmother used to make. She said, “My mom told me that when I was three, I used to take a jar of my grandmother’s umeboshi and hand them out to my friends when they came over. Unfortunately, she passed away several years ago before I could try and learn how to make umeboshi from her.” Noriko learned to cook from her mother, father, and grandmother. The first thing she ever cooked was a fried egg when she was 3. She says that a lot of people tend to assume that she would cook American food now because she has lived the majority of her life in the US. But, she explains, she cooks mostly Japanese or Chinese food. Her in-laws live in the countryside and grow organic vegetables as a hobby and send her tons of seasonal vegetables all the time, so she tends to use a lot of vegetables in whatever she cooks. Noriko shared her recipe for chirashi sushi with me. This was one of the meals that she would ask her mom to make when she was growing up, and now one of her favorite things to cook. Chirashi sushi (pronounced “chee-raw-shee-zoo-shee”) literally means “scattered sushi,” and is sushi rice with a variety of other ingredients mixed in and toppings sprinkled over the top. It is easy to make—no tricky rolling skills required! There are 3 main steps to making chirashi sushi: 1) making Japanese steamed rice, 2) making the dressing for the rice, and 3) mixing the dressing with the rice and adding other toppings. Noriko uses kanpyo in her chirashi sushi dressing. Kanpyo (our mystery ingredient is revealed!) are ribbons of dried gourd. They are spiral cut from a large gourd called a fukube (calabash or bottle gourd). 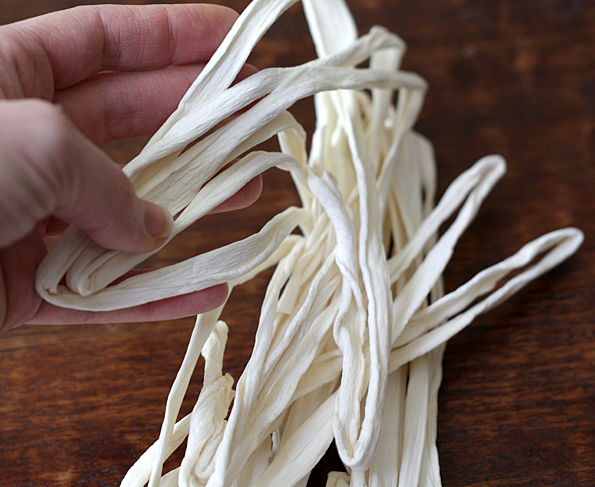 The ribbons are soft and pliable and smell like dried apples that have been dipped in vinegar—sweet and slightly tangy. It is rehydrated and simmered in the dressing for the chirashi sushi and is absolutely delicious. For toppings, Noriki usually makes kinshi tamago (but you could use sweetened scrambled eggs instead) and adds snow peas and nori. When combining the simmered mixture with the steamed rice, Noriko always uses a sushi oke (special wooden sushi rice bowl), but if you don’t have one then she says a regular glass bowl is ok. She says you should try not to use a metal bowl when combining the rice with the simmered mixture because this can affect the taste. Noriko says she cooks the dressing for the rice in large batches and freezes each serving in ziploc bags. That way, whever she wants to make chirashi sushi, she can just defrost the amount she needs to use. Noriko’s chirashi sushi is absolutely delicious—I know because we had it for dinner last week, and it was a hit with every single member of the family. It’s no wonder that it’s a favorite of Noriko’s! It’s all of the deliciousness of sushi without the fuss. 1. Rub a pinch of salt into the pieces of kanpyo and soak it in water for about 6 hours. Soak the shiitake mushrooms in water for about 6 hours. 2. After the kanpyo has soaked, boil the kanpyo in a pot filled with fresh water for about 10 minutes. Cool the kanpyo under running water, drain the water, and slice the kanpyo into small pieces. After the shiitake mushrooms have soaked, drain the water and cut them into small pieces. 3. 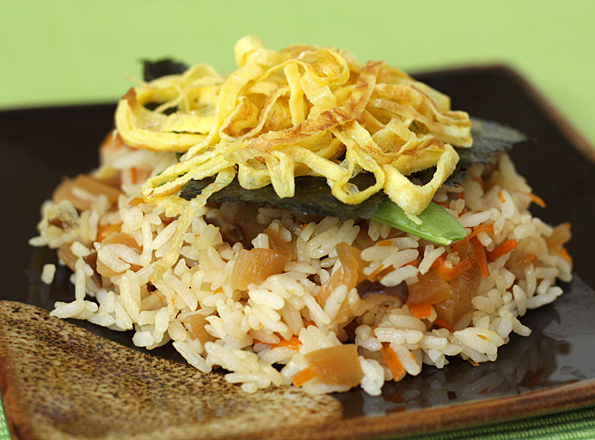 Slice the lotus root into thin slices and soak in water for 10 to 15 minutes. (If you slice the lotus root too small or too thin, it will break, so slice carefully!) 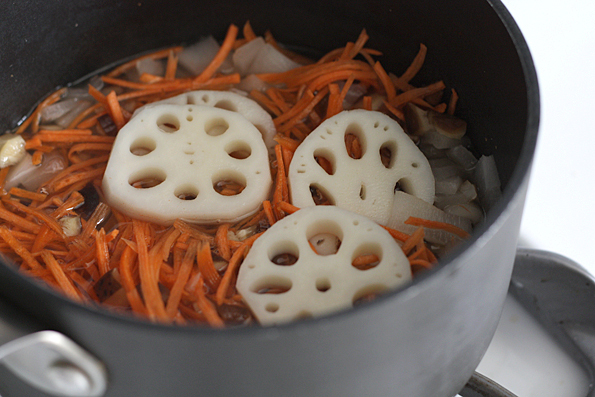 While the lotus root is soaking, slice the carrot into thin matchsticks (not quite julienne but close!). 4. 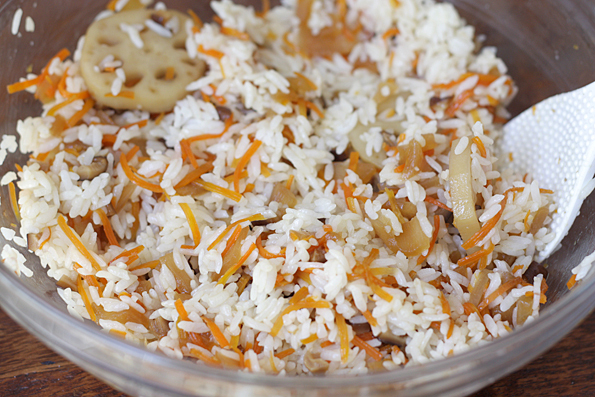 Combine the dashi, sugar, and mirin in a pot and add the kanpyo, shiitake mushrooms, lotus root, and carrot. Cook over low heat until the liquid is 2/3 of the original amount. Add the soy sauce and cook until all of the liquid has evaporated. (Don’t add the soy sauce before this point, or it will make the mixture too salty.) When the liquid has evaporated, turn off the heat and let everything cool in the pot. 5. Add the sushi vinegar to the cooled ingredients in the pot and then fold everything together with the freshly steamed rice. 6. Put the rice mixture on a large serving plate, sprinkle with snow peas and nori seaweed and then finish with the kinshi tamago strips on top. 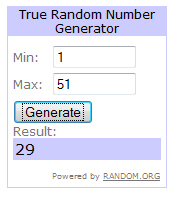 The winner of the “Sneak Peak” Giveaway, as picked by the random number generator, is comment #29: Mardi of Eat, Live, Travel, Write who guessed, “It’s definitely a dried vegetable (gourd) of some sort…” Congratulations! 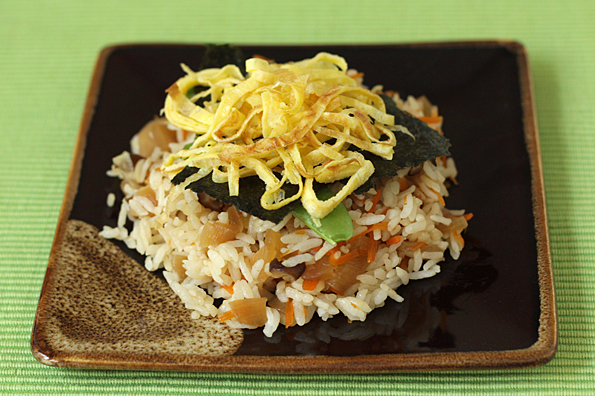 I’ll be sending you a package of kanpyo so you can try making chirashi sushi! 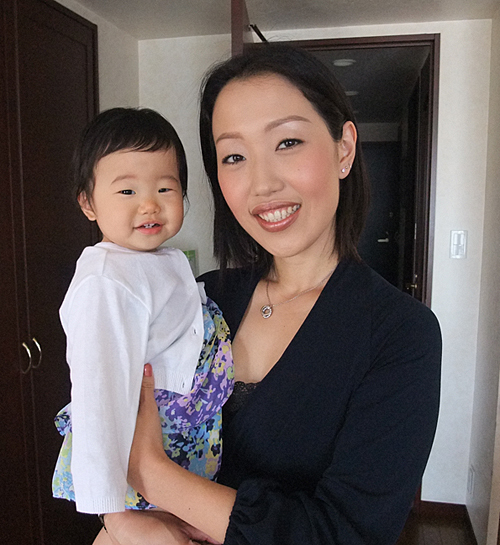 Noriko & her little girl are gorgeous! What a wonderful story about Noriko and her family and the chirashi sushi looks so delicate and tasty. Great recipe, with a lovely story to go with it! Recipes passed down from family and friends are always the best ones! I’ve been dying to try lotus root, but I can’t find it around here. This whole dish looks fantastic! I love this recipe for “deconstructed” sushi! And I won the contest!! Will definitely have to give it a go at home! Thanks so much. I loved this post and the story that went with it! What a fantastic recipe, and a gorgeous photo! (Noriko and her daughter) Too bad I didn’t win, I’d love to try it! I love lotus root! (ok I like it, it doesn’t have that strong of a flavor to “love” it) hehe! Another beautiful Mum and bub! And more beautiful Japanese food! I don’t think I will ever have time or patience to make this, but I can dream and try and find a restaurant in Australia (wish me luck) that makes it! Will have to give it a go after my attempt at Miso Soup! That is a beautiful presentation! Incredibly appealing. Tonight I cooked this very same dish from a recipe in a german sushi cookbook (but written by japanese chef). I was surprised at how close your ingredients are to my recipe, this must be a popular recipe in japan to be this standardized. The only differences I note are that your recipe lacks the pickled ginger mine said to use and the rice is different quantitity. Its an excellent recipe, as someone who more often makes more indian subcontinent and western/central asian/middle eastern food, I am less familiar with japanese food. Generally the lack of dairy products scares me off from delving too far in far eastern asian cuisines. The flavours in the recipe are subtle but very pleasing. The use of rice wine and vinegar reminds of spanish/italian/greek cuisine (not to mention the flavour of tamari soy sauce has anchovy like characteristics). I an contiually impressed with the korean and japanese restaurants I try. So far the korean wins for combination of quality, authenticity, low price and chilis (it is intrigueing that korea uses almost as much chili as india and japan uses almost none.) I will continue venturing into japanese cuisine, however I dont understand how a billion people live without any usage of dairy products, Its almost sacrifiledge to me. And I say that as someone who eats a moderate amount of dairy products, but a little goes a long way to please the stomach. the recipe talks about kampyo but in the ingredient list no amount is given for it. @divadmas — Thank you for saying something! When I switched my recipe format a while back a few things got a bit missed up. I caught most of the problems, but occasionally one pops up, like a missing ingredient! Corrected! 12 inches of kampyo.